I was at LAX airport yesterday and was so excited to discover they are launching a new program for families with autism! On Sunday, April 18, 2015 they launched their Flight Experience Program, where families with autism can have a trial-run of travel of the flight experience so they can be better prepared for the real thing! Participating airlines also have a voluntary self-identification program where a person with autism and their families wear a specially-designed sticker to make others aware they have autism or are traveling with someone with autism. The hope is that this will make others more helpful and understanding should a meltdown or outburst occur. I believe this makes the 16th U.S. airport to offer trial flights for those with autism. Here is a list of other participating airports. 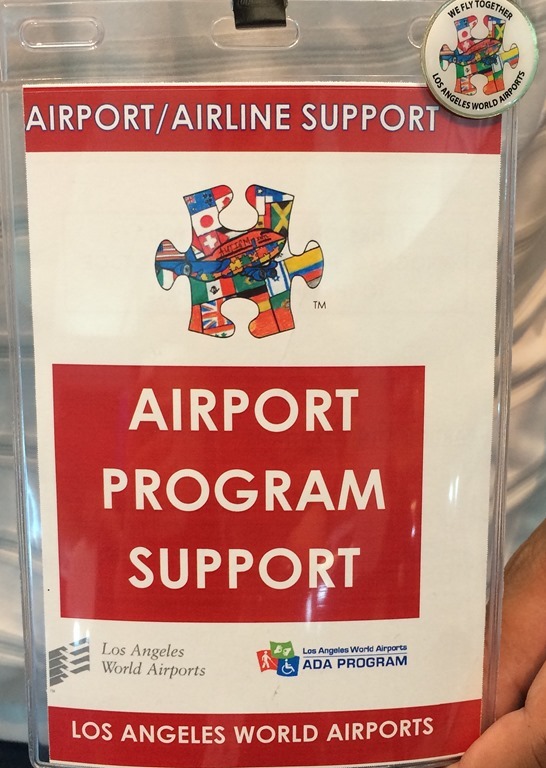 (Los Angeles, California—April 18, 2015) Los Angeles World Airports (LAWA), participating airlines and partner agencies today launched its Flight Experience Program, offering a practice airport experience at Los Angeles International Airport (LAX) from check-in to boarding for families with autism to help prepare for future travel, and help reduce anxieties and fears associated with flying. American Airlines hosted today’s program. Students from the LeRoy Haynes School, a nonprofit organization dedicated to helping children with special needs, participated in this first run of the program. They started by registering for the flight experience by visiting www.lawa.org and clicking on the ADA symbol. Upon arrival at LAX, the participants checked in as if they were actually taking a flight, received their boarding passes, and proceeded through Transportation Security Administration (TSA) screening, and on to their gates. When the flight was called, families boarded the aircraft, took their seats, and followed the usual airline procedures, giving participants an educational and realistic travel experience. LAWA has been working with its partners including airlines, airport tenants, the Transportation Security Administration (TSA), wheelchair service providers, and the LeRoy Haynes School to address the needs of families with autism when traveling by air and to create public awareness about autism and possible behavioral issues that may arise at the airport or in-flight. Recently, LAWA also initiated an autism self-identification program that allows persons with autism to share that they have an intellectual disability by wearing a specially-designed sticker created by a team of 13 students from LeRoy Haynes School. It is hoped that the sticker will help minimize misunderstandings. When a police officer or airline employee responds to a situation and sees the autism sticker, it alerts them that the individual has autism. They may, in turn, handle the situation in a different manner by offering assistance in a quiet area or other options. Rolon added that the self-identification program is the result of input from families with autism who express a fear of flying with family members with autism. “Family members worry that loved ones with autism may become confused in an airport environment, creating an outburst that could result in a negative response, when actually, the person may only be trying to communicate or is reacting to stress caused by being in an unfamiliar environment,” he said. Both the “Flight Experience Program” and the self-identification program are free and voluntary. The programs are sponsored by LAWA and its airline partners. Families wishing to self-identify can ask for stickers at the ticket counters of participating airlines. LAX is the fifth busiest airport in the world and second in the United States. LAX served nearly 70.7 million passengers in 2014. LAX offers 692 daily nonstop flights to *% cities in the U.S. and 928 weekly nonstop flights to 67 cities in 34 countries on 59 commercial air carriers. LAX ranks 14th in the world and fifth in the U.S. in air cargo tonnage processed, with over two million tons of air cargo valued at over $91.6 billion. An economic study 2011 reported that operations at LAX generated 294,400 jobs in Los Angeles County with labor income of $13.6 billion economic output of more that $39.7 billion. This activity added $2.5 billion to local and state revenues. LAX is part of a system of three Southern California airports—along with LA/Ontario International and Van Nuys general aviation—that are owned and operated by Los Angeles World Airports, a proprietary department of the City of Los Angeles that receives no funding from the City’s general fund.